I have already published a detailed post on how to customise your comment boxes/balloons. This issue came up for me the other day, and I wanted to note down some quick instructions. 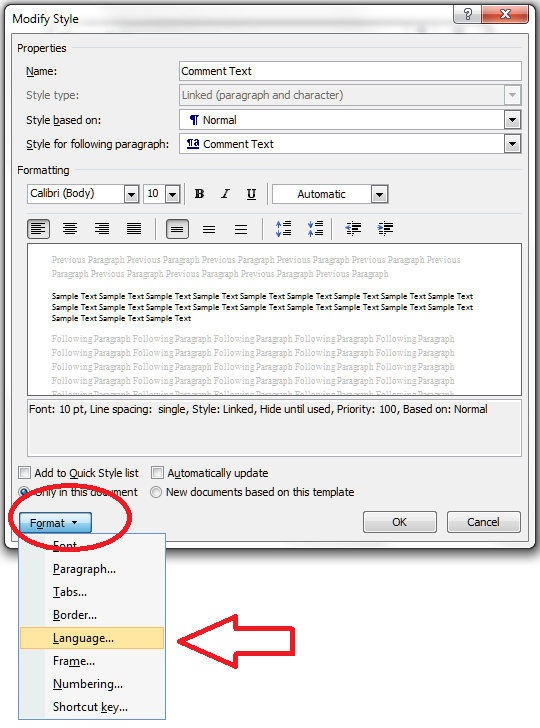 Please note these instructions are for Word 2010 and upwards for Windows and may not work in other versions. Why are my comment balloons in a different language? In my case, I was running a final spell-check over a document when I suddenly realised that my comment balloons were in Australian English (I realised this when the spell-checker switched over to Australian English while taking exception to a word I had not, in fact, mis-typed). Why would this be? Well, the formatting of the comment balloons comes under its own Style, separate from normal text, so at some stage this document, or the computer it came from, or the template the author was using, had come to have Australian English as the comment box language. How did I get it back to UK English? How do I change the comment balloon language? This gives you the Styles dialogue box. Once you’ve got the list into alphabetical order, find Comment text, and then click on the Modify button. And then all the OK buttons to get back. 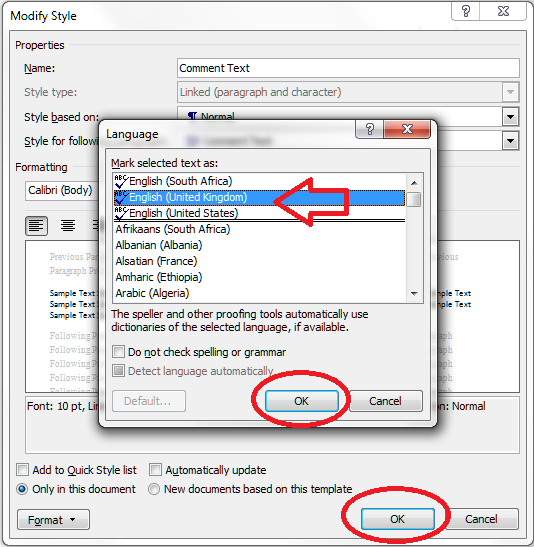 Press the OK button, and carry on pressing OK buttons until you get back to your document. Now your comment box language will be whatever you asked it to be! Finally I found a decent tutorial on how to change this. I exchange documents with people from many other Countries and it was quite annoying to have a different spell checker for each document in the comments box. Just another question: This procedure did not change the language to the comments already added (it affects only new commnets). Is it possible to change the language of all existing comments in a document? Thank you for your comment and I’m glad that you’ve found the article useful. 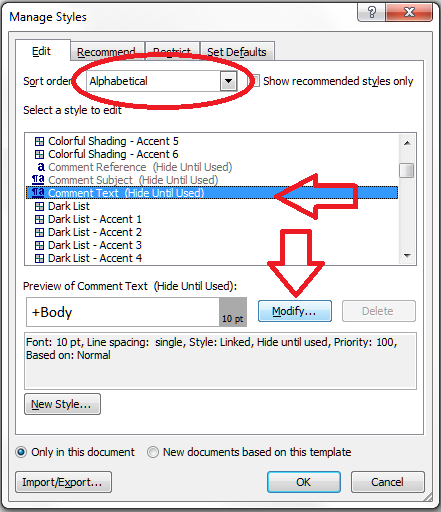 Two options to try: 1. click into a comment, highlight them all using the highlight button or another means, then apply the change; 2. create a new document, set up the comments language as you wish, then paste your document into it. Let me know if either of these work for you! Thanks for this. WHY would this happen in the first place? Who knows – that’s the case with many of these posts, c.f. “Why are my comment boxes in Word tiny” [all of a sudden when I did nothing to make this happen myself]. Oh bliss – at long last an answer to a problem that has long bugged me and I’ve never been able to find out how to fix it. In answer to Stephen, my guess is that the person who made the document in the first place was working on a computer set up in a different country and while they used the ‘Language’ button to format the text in English it doesn’t affect the comments, a glitch that Microsoft needs to address. Ah, yes, that could also be true. I honestly don’t know what’s wrong. Could I be missing something else? I have already tried changing styles and even making my own style and this still happens. Hm, tricky. 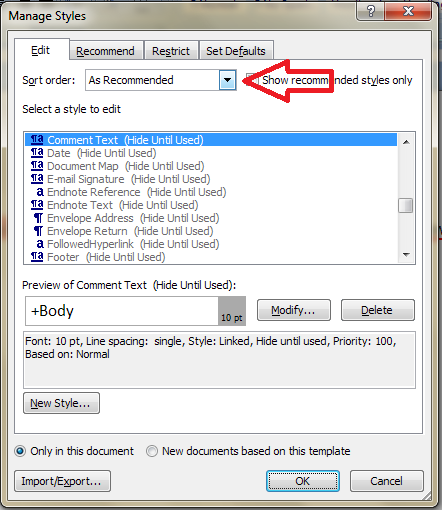 Have you tried the instructions in https://libroediting.com/2012/07/11/what-to-do-if-my-comment-boxes-are-running-right-to-left/ ? Hi Liz – I can change the language of the comment boxes, but the default button is greyed out. Regardless of whether I check the box “apply to all documents in the same format”, it always defaults back to Turkish. I’m pulling my hair out on this one – any ideas? Hm, that is a tricky one. You might need to look at the languages you have enabled and apply English as your default language for Word itself rather than just comment boxes. I assume you’re not in Turkey and it’s not a version of Word bought in Turkey? Like! Who would thought one have to take some many steps in order to change that! Thank you! I am using 3 languages, great thanks for your explanations, very helpful. I’ve glad I could help! Thank you very much! Just what I need and perfectly explained! MANY thanks. Such a relief to be able to fix this! THANK YOU SO MUCH. I tried finding this on my own, but it never occurred to me to look in Styles (I was playing around in Options). Much much appreciate this post. I don’t know why my comment went from ‘I very much appreciate’ to ‘much much appreciate’ , but I’m owning it 🙂 And thanks again. Very helpful, very clear and easy to follow. Thank you very much! You are a lifesaver! Thank you so much! You’ve solved a longstanding problem for me today with this advice. I’m so glad I discovered your site – it is most helpful. I keep coming back to this column over the years to find a solution to an ongoing problem but have never found it… I have no problem changing any languages except for Hebrew. No matter how many settings (all of the above) are changed, the comments always return to Right to Left and appear as “Hebrew” under the language settings. Even when forcing the left-to-right option, the text is messed up because it still reads it as a right-to-left language. Of course, MS is utterly useless, and I have never found a solution. I end up requesting the client to change it themselves (which works), indicating it is a program-related issue. I don’t have a Hebrew language pack installed (Word 2010). Any further thoughts? Thanks for the blog — I’ve found it very helpful over the years! Thanks for your comment, Jake. Is there a reason you haven’t installed the Hebrew language pack, as I believe that would resolve the issue? That’s the only thing I could think of, apart from problematic stuff like uninstalling and reinstalling Word or upgrading to 2013 or 2016, I’m afraid. Let me know what happens.